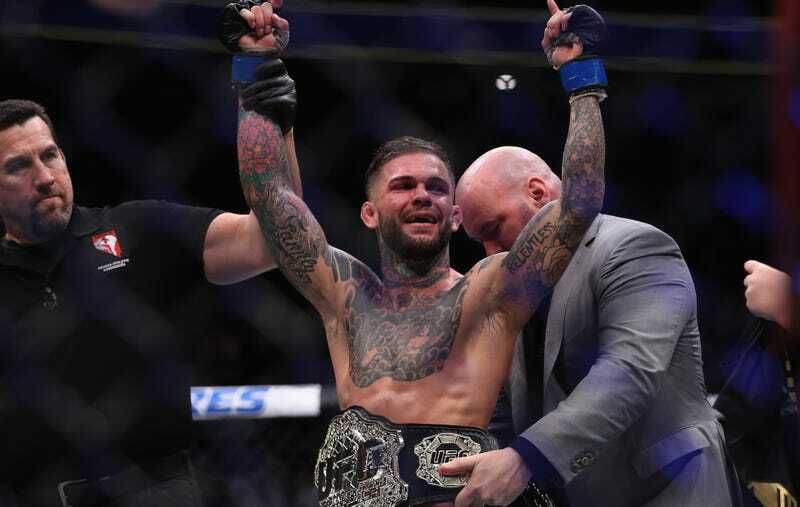 Former UFC bantamweight champion Cody Garbrandt will fight T.J. Dillashaw for his belt on Saturday, nine months after getting his face punched off by Dillashaw in his first-ever loss as a professional. In the run-up to the fight, MMA fans have surfaced a treasure trove of old tweets from Garbrandt, in which he drops a whole bunch of slurs, both racial and homophobic. Garbrandt was asked about the tweets today, and he initially brushed it off, saying, “I don’t even address that, that was, what, when I was a teenager? Anyways, next question.” (He was, at youngest, 21 when he did the tweets in question.) After leaving it there, he spoke with MMA Junkie and explained a bit more about why he felt there was nothing wrong with his tweets. “First and foremost, it shouldn’t be embarrassing. I’m going to be a man and address it once, and that’s it,” he said. The problem, to Garbrandt, is that everyone is just trying to be negative. The state of the UFC world is such that Garbrandt’s tweets are not exactly the only problematic sentiments in the sport. Colby Covington is an interim champion, and he’s publicly called Brazilians “filthy animals.” Conor McGregor joked about enslaving José Aldo’s neighbors. At least people are starting to get called out a bit for it, even if Garbrandt has no sense of shame.